Ok so it may not be the nursery you were expecting LOL…but that’s coming along too! It’s amazing how a house is ever-evolving. We have turned the spare bedroom into a plant nursery/yoga room, and the basement storage bedroom into a suite for friends and family. (I’m amazed at the spring cleaning we achieved, that room was pretty full!) 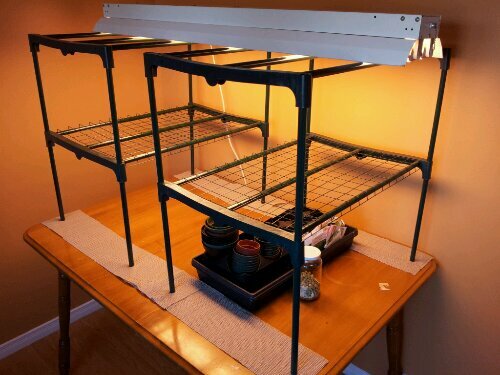 I’m excited to start my seedlings with the fancy agro light I got for a $20 steal at a garage sale last year. I had to change the plug end but that’s an easy fix considering the work I did in the theater years ago. Seedlings this year: jalapeno peppers, red peppers, green peppers, red cabbage, and possibly something to brighten up the shady side of the front gardens. Debating tomatoes, they were a lot of upkeep and I’m going for low maintenance this year with the baby coming end of July. So here we are, March 9th. Still buried under 4 feet of snow but the sun is shining, the clocks have sprung forward and my optimism abounds. I figured the best way to channel this energy is to put it on paper! 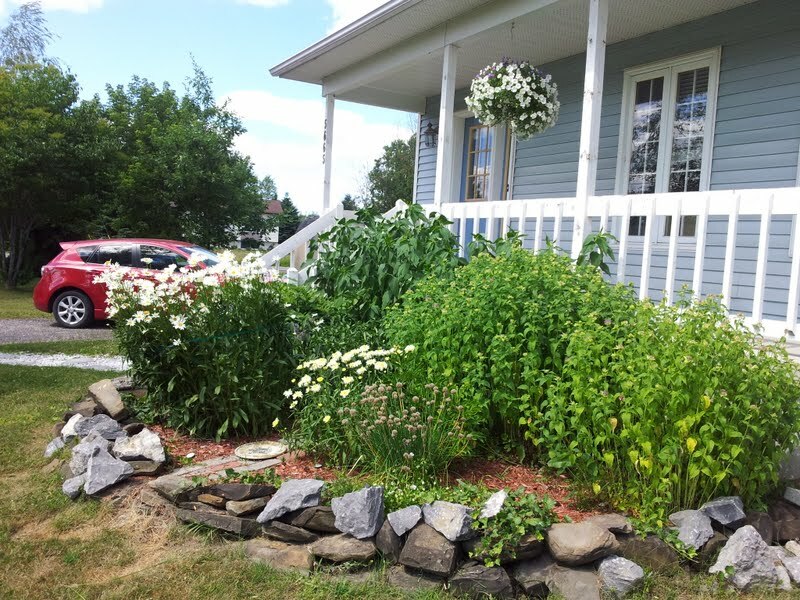 This year I am keeping it simple (sort of) with mostly low maintenance, bug free type plants. I have found that tomatoes are a hassle to trim and cucumbers, although tasty, attract cucumber beetles (funny that…). I’m sticking with squashes, root veggies, and the ever popluar peppers, peas and lettuce. New roots will be beets and shallots, and thanks to a friend’s seed exchange butternut squash will makes its first appearance. I fell in love with spaghetti squash last year so I’ll try that too, we will see how that goes! In the side garden, the annual asparagus will be ready to harvest in its third year. 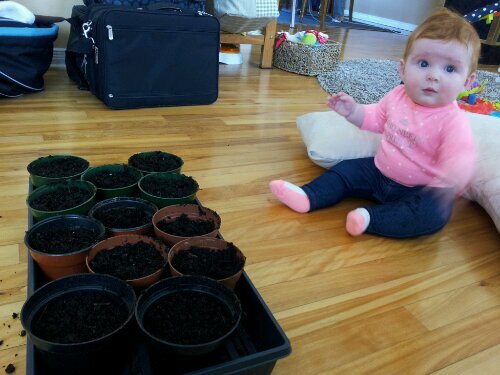 I may add a few more seeds depending how much room the rhubarb takes up. I removed the ugly black compost bin (in favour of a pile behind it) and that’s where our pumpkins will go, along with a trial season of red cabbage. I didn’t have a lot of luck with the brussels sprouts in 2012 but there was also a heck of a learning curve that year too. Now let’s get that snow melting!! Well, the pumpkin patch has withered, and left only shocks of orange in the gray mud. I have plucked them from their vines and they now sit proudly on my front stoop to finish turning orange. I still have one left on the vine, a late bloomer that will hopefully be orange in a couple of weeks. The snap peas left a large number of dried pods on the vine, and I have more than I need to plant another crop next year. 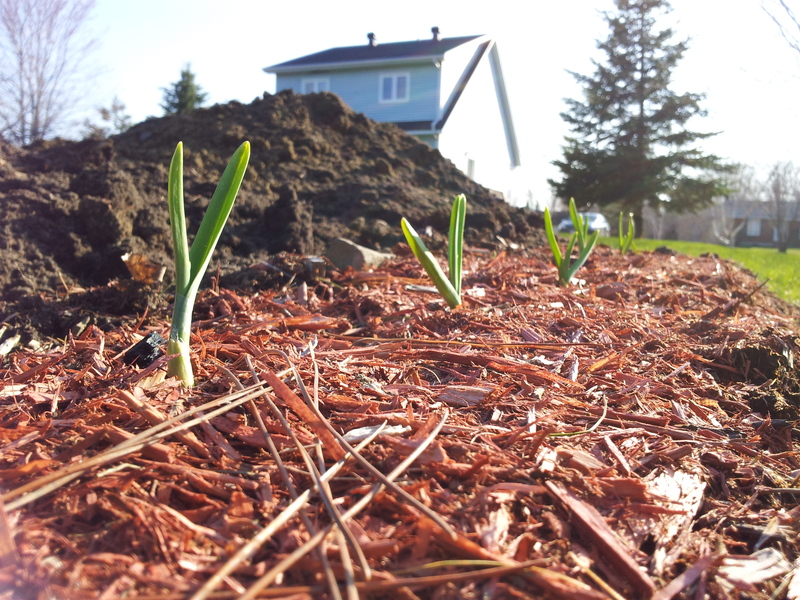 They have been cleared, and compost has been turned into the soil where I will plant my bounty of garlic cloves in a week or so. I still have carrots, kale, celery, peppers, jalapenos, and some little baby romaines…we’ll see if they get any bigger. It has threatened frost a couple nights, but since it’s only been down to about 3 degrees we’ve been safe. Time to start thinking about next year…corn again, with a fence this time? Green beans? Beets? The return of tomatoes and cucumbers? Perhaps only one or two kale plants though, I have more than me, my workmates, and friends know what to do with. 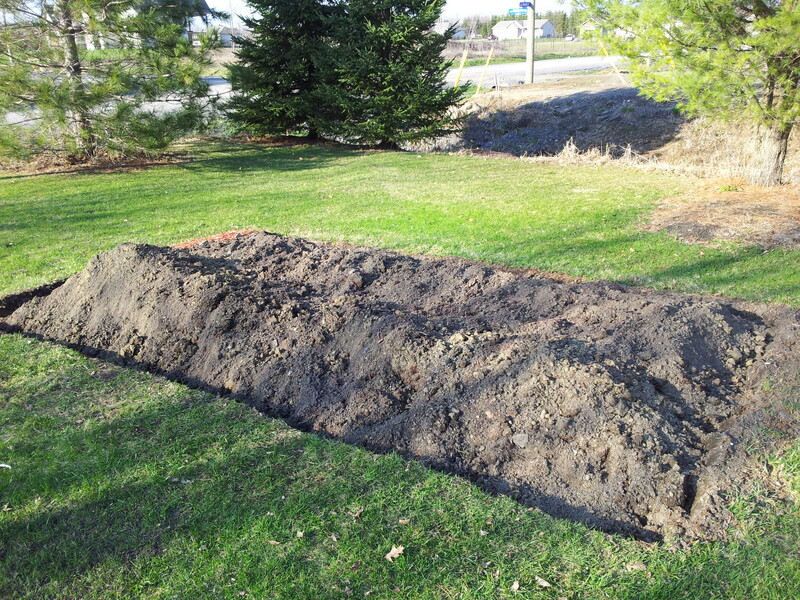 One thing is for sure – I’m getting some straw mulch! I’m too close to an unkempt ditch not to have some protection against the weeds. Garlic comes out of the garden tonight! Snap peas are already being harvested (and eaten). I have beautiful pumpkin plants growing exponentially by the day, and I’ll train them through the corn when they get long enough to see if that works as a natural mulch. The carrots are coming up tall and strong, and I added more seeds in the spaces between to get a second harvest…I don’t have any mulch though so I hope the ground doesn’t get a crust on it that the seedlings can’t break through. I’ll try to keep it wet enough! I’m a bit concerned about my pepper plants. This would be the second year in a row they haven’t thrived quickly, and although I’m sure they’ll catch up, I do see pepper plants in other gardens that are already bushy and producing fruit. I will have to test the soil and see what I could do in that respect, since the rain has been amazing this year as opposed to last year’s drought. 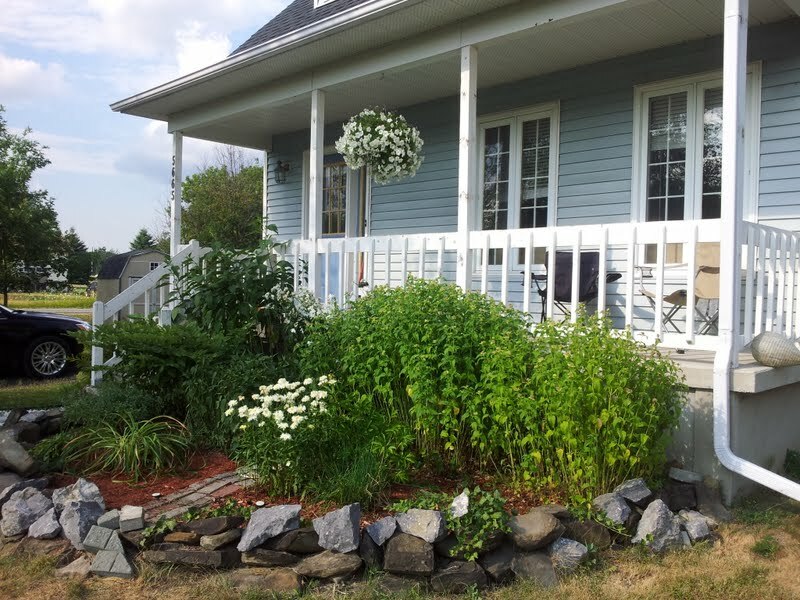 The perennial vegetable garden has two rhubarb plants and four asparagus in it. I’ve already made two Rhubarb Crisps, and next year we will be able to harvest the asparagus. The only tricky part is keeping the weeds down in that garden. In fact, the location of both of the gardens is close to a field of weeds, and my choice to not mulch this year has me reconsidering last year’s love affair with the stuff. The community garden has tomato plants, cucumbers, and watermelons in it – and I’m starting to wonder if I should build my own raised beds with mushroom compost! I can’t believe how well everything is doing, and how quickly the cukes sprouted. There’s fewer weeds, and no ants! So here begins another gardening adventure! I have expanded the garden by about one foot this year. I’m not half as crazy as I was last year, the learning curve has certainly leveled off, at least for a while. 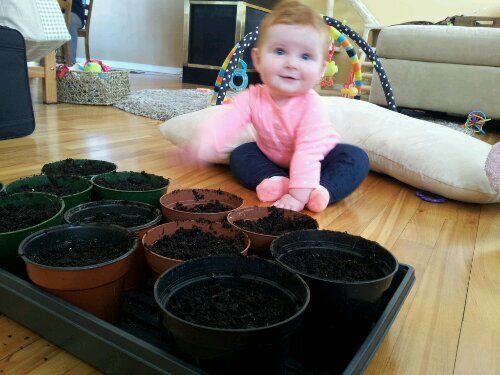 I would *like* to test the soil and amend it appropriately for the vegetables I plan to grow in each row…but I am also wondering what it would be like to be hands off for a year, considering how hands-on and overprotective I was last year! I’m going to plant in some semblance of rows this year. 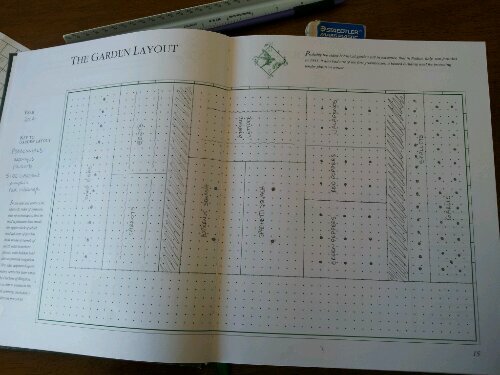 From left to right I plan to grow garlic, red green and jalapeno peppers, kale, corn, carrots, pumpkins, romaine, and snap peas. I will plant successively too to keep crops going through the summer. I’ve already got my garlic coming up! So there you have it – the first veggie sprouts of the season! 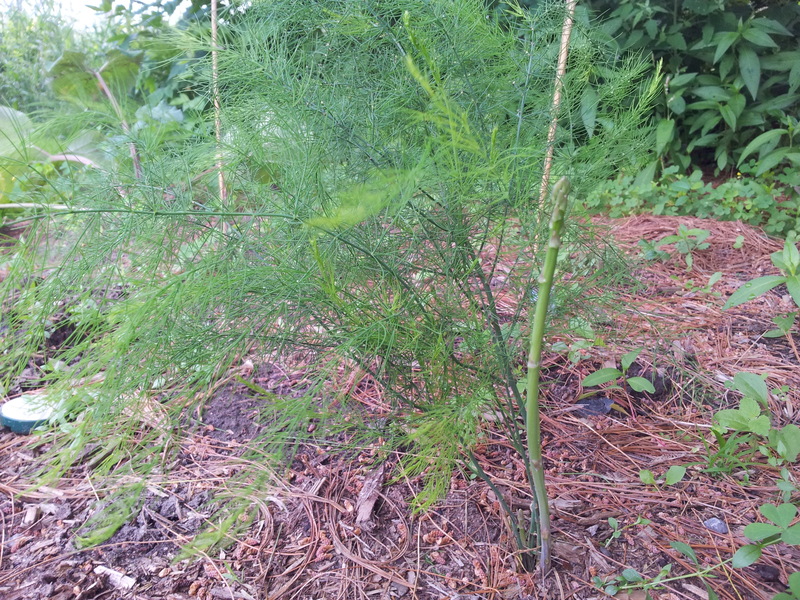 Can’t wait to see how my asparagus will be in their second year. We also have kept two community garden raised boxes so I’m excited to grow some watermelons, tomatoes, and pickling cukes there. I’m avoiding cukes and zukes in my home garden to try to control the cucumber beetle and stink bug population we had last year….I know I’m taking a chance with the pumpkins but this is the last year the home-grown seeds will work so I will take good care of them! 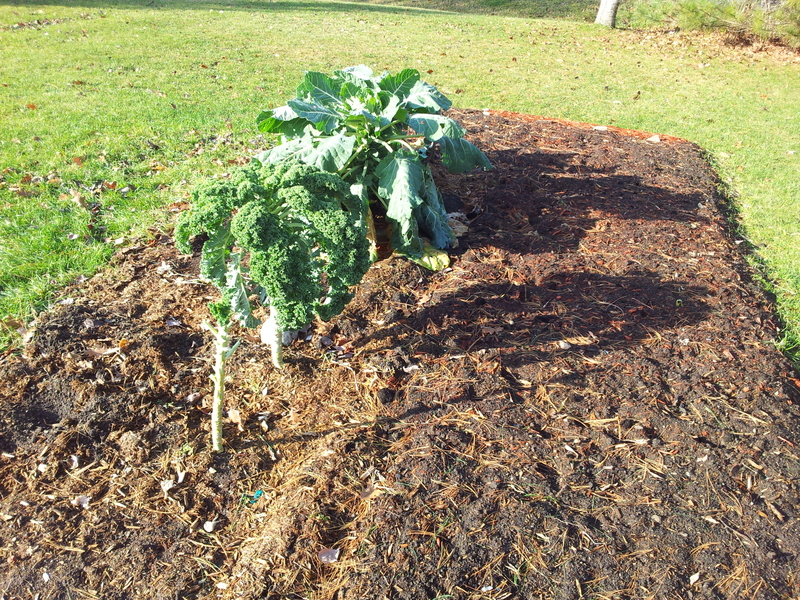 Well…here we are mid-November and I’m pleased to announce I still have vegetables growing! My Kale is ridiculous. It’s been going down to almost -10 Celsius some evenings, and it is actually still thriving. I picked most of the kale and froze it a while ago, but left one plant just to see what happens. I also was too lazy to pull out the stalks from the ground after the harvest…Funny thing is, the stem of one of them sprouted new leaves! I’ll bet this stuff would grow after a nuclear bomb. The Brussels Sprouts are doing really well. I don’t think they’re as strong as they could be due to being stunted in the beginning, the sprouts are all opening up – they’re not packed nice and tight the way you buy them in the store. One plant will probably give enough for one meal…makes you appreciate how much time and space is necessary for those little guys. Very, very excited for next year. I have already planted seven garlic cloves. I’ll be trying some new vegetables and fruits (corn, strawberries), and doubling up on some that went really well this past year (snap peas, romaine lettuce). I think I’ll pass on the cherry tomatoes, and although cucumbers were so delicious I might give it a year off to curtail the cucumber beetles for a while. So, so grateful to have the opportunity to pick and chose a wonderful edible garden, and I’m so excited to start planning for next year! So this is my little plot with all its fantastic glory, still intact! Things really started growing late July! I now have a lovely healthy pickle cucumber plant (bottom right), which despite its slow start seems to be the strongest of the bunch. I think it really likes the trellis as opposed to the circular cage I gave the other two english cucumbers. You can see the red coming on the red pepper in the front, yipee! The snap peas grew to 6′ tall, blew over, and were recovered. It was the mildew that eventually took them down for good, probably because I had so many plants together. My cherry tomatoes had to be supported with 6′ spikes, they began growing all over the place uncontrollably. The potted tomato plant is so top heavy it actually took a tumble the other day, I’ll try planting it into the empty space you see in the front. I’ve started pumpkins, carrots, and a second batch of zucchini late in the season so hopefully they get a chance to bloom before the cool comes, can’t hurt to try. I’ll pop some lettuce seeds in there too tonight for a possible late summer romaine harvest. After all the things I’ve seen this year I am so excited to start planning for next year. Plant-specific soil amendments, the correct kinds of support, and different mulch (or none at all!) are at the top of my priority list. Watching each plant blossom then produce has been an important lesson, so I’m sure I’ll be succession planting for a longer harvest too! It’s not over yet, we’re getting into colored peppers and cucumber time! Update! I can’t believe the green. We’ve been eating snap peas like crazy. Things are certainly taking up the space that the seed package warned! The brussels sprouts especially, those leaves are huge! My favorite right now is the lettuce – I have let three of each kind do their thing, and they have become amazing trees that I can just pluck leaves off of. Very cool! A bit of an ongoing battle with pests – I found stink bug babies all over the cukes and zucchini and used a soap and water spray that was too strong. I lost the zucchinis, unfortunately, and the cucumber plants are just starting to recover. I’m starting a second batch of zucchini, they might not have much time to produce a lot of fruit, but it’s worth a shot! As for the pumpkins, I have transplanted my new babies into the garden. We are also going to put some in the community garden, see how the difference in soil works for them. As long as we get a couple of guys to carve into jack-o-lanterns I’m happy. Next up: moth balls to repel the little white cabbage moths, and an update you on how the 5-10-5 fertilizer works on the watermelon and the new pumpkins! Today as I thinned out the overgrowing Jerusalem Artichoke in my front garden, I had a revelation – why not move those humongous daisies into the bald spot I had now created? There is also what I think is a tiger lily plant hiding behind all these taller flowers, perhaps it could move where the daisies are now? So I did a quick google search on moving perennials – apparently this is common practice, and it’s not too impossible to do. The only thing that was a bit tough was that the daisies are so incredibly large, it’s almost like moving a tree! I was totally duped – my “pumpkin patch” is nothing more than wild cucumbers. Very disappointed, however, while pulling out all the plants, I found patches of eggs on the back of some of the leaves and about 5 different kinds of bugs I hadn’t seen yet. So there ya go – I was harbouring some interesting life, which may or more likely may not have been detrimental to my veggie garden at some point. Hopefully I wiped out some of the cucumber beetle population!